TuffStuff’s #1 selling, patented Six-Pak Trainers have been changing the shape of strength training ever since their introduction in 2008. Solid and stable 3” round 11-gauge tubular steel with a combination of 2×3” oval tubing and 2” round tubing. Compact, space efficient European-style design cable motion technology. 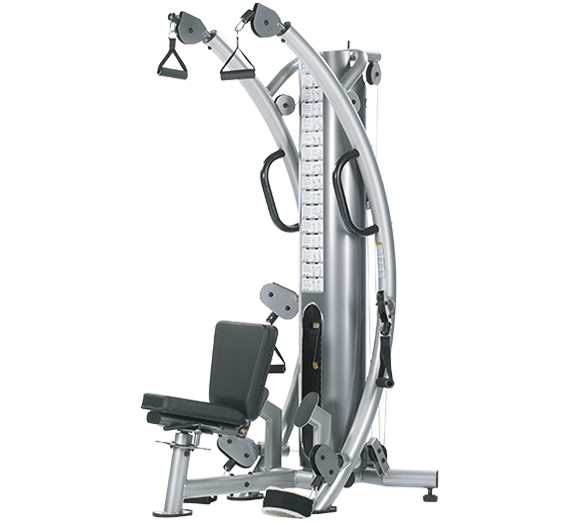 Unique 360º rotating bench easily adjusts to flat position to accommodate various bench cable exercises. .094 USA-Made/Certified EXERFLEX PRO 1000 lbs. high performance fitness cable. Two-tone powder coat finish – Platinum Sparkle and Ebony Chrome. Durable high density pads upholstered in premium grade naugahyde. Full length protective steel weight shields. 200 lbs. steel weight plates.